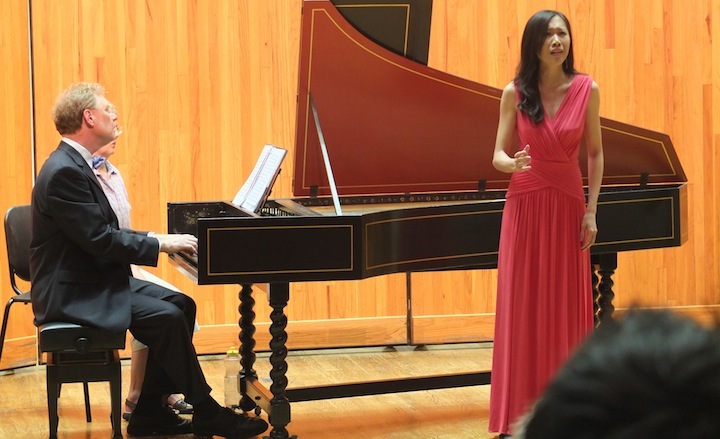 Classical music: This year’s second annual Handel Aria Competition is Thursday night at 7:30 p.m in Music Hall with anpre-concert lecture at 6:30 p.m. in Room 2650 at the nearby Mosse Humanitites Building — and is almost guaranteed to be a sellout. 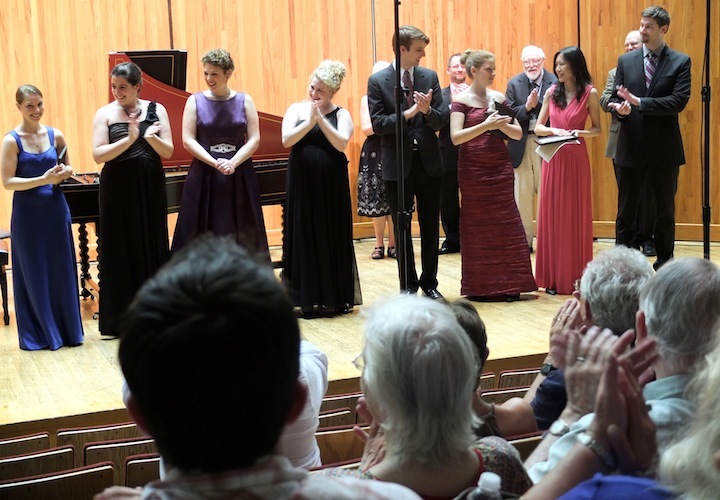 This week, in conjunction with the 15th annual Madison Early Music Festival that is running from Saturday, July 12, to Saturday, July 19, the second annual Handel Aria Competition will take place this Thursday, July 17, at 7:30 p.m. in Music Hall, 925 Bascom Mall, at the foot of Bascom Hill on the campus of the University of Wisconsin-Madison. 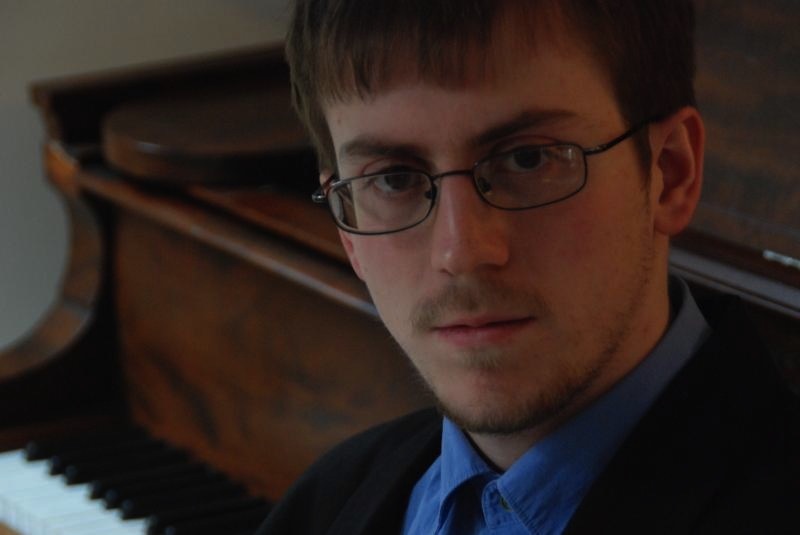 A free pre-concert lecture will be given at 6:30 p.m. in Room 2650 of the nearby UW-Madison Mosse Humanities Building by John W. Barker, who writes music criticism for Isthmus and for this blog and who is a big and longtime Handel enthusiast. NOTE: The Handel Smack-Down will NOT take place in Mills Hall, as it did last summer, because Mills Hall at the UW-Madison School of Music, is closed while it undergoes an upgrading of its electrical system. 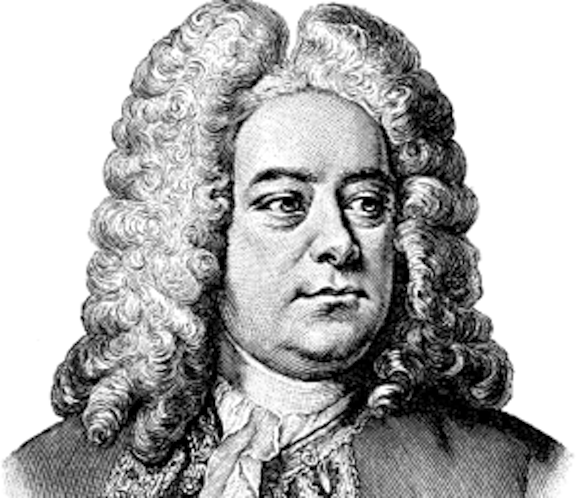 The Handel Aria Competition was established in 2013 to encourage emerging singers to explore the repertoire of Handel. 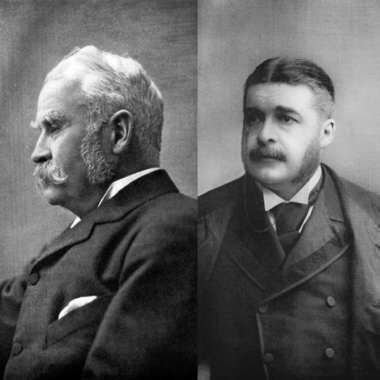 Founders Dean and Orange Schroeder (below bottom), who own Orange Tree Imports on Monroe Street, are enthusiasts of the vocal repertoire of George Frideric Handel (below top) and are lifelong supporters of the arts. 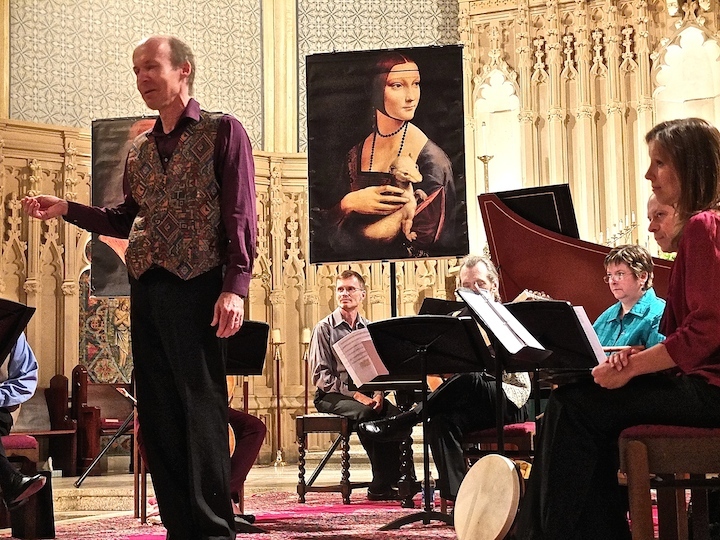 An ongoing partnership with the Madison Early Music Festival has helped to continue the program, which is not actually part of MEMF. This year over 60 singers applied. Seven were selected as finalists who were then invited to compete for scholarship awards to be used toward their professional development as young artists. That number, by the way, is fewer than last year, which should make the concert more manageable and enjoyable for both the public and the performers. The live competition of the final round is what is being held Thursday. This year’s competition is “new and improved,” it seems. 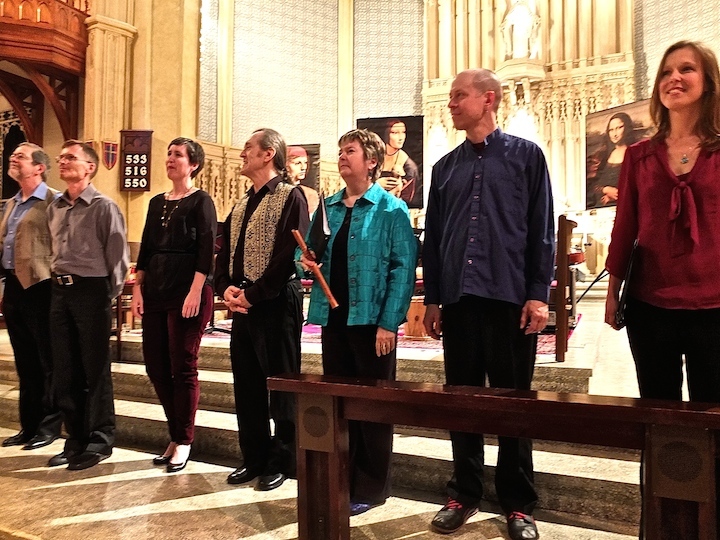 Last year, just a solo harpsichord – finely played by two early music keyboard players — accompanied the singers. 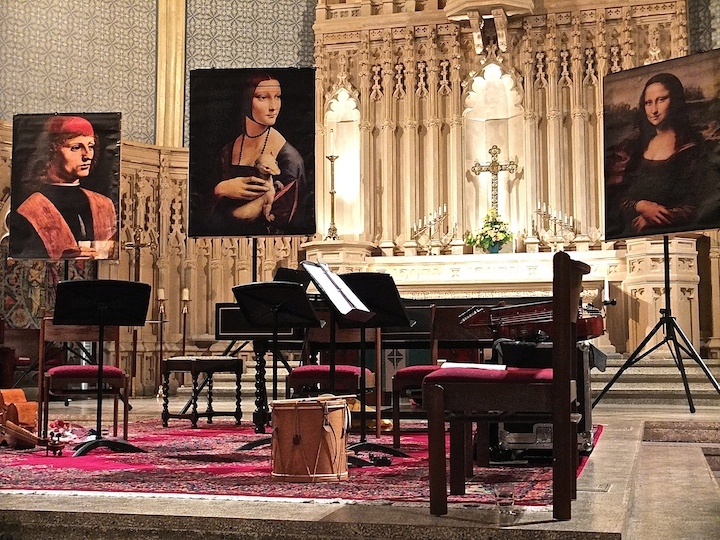 This time, they will be accompanied by a consort that includes a harpsichord, two violins, a viol and a viola da gamba. Tickets are $10 and are available in advance through Brown Paper Tickets and are online at www.handelariacompetition.com. You can also phone 1-800-838-3006. On the day of the show, tickets go on sale in person at Music Hall at 6 p.m. – CASH ONLY — with doors to the theater opening at 7 p.m. Please note: As the event is in Music Hall this year due to renovations taking place in Mills Hall, seating is limited to 375 audience members. 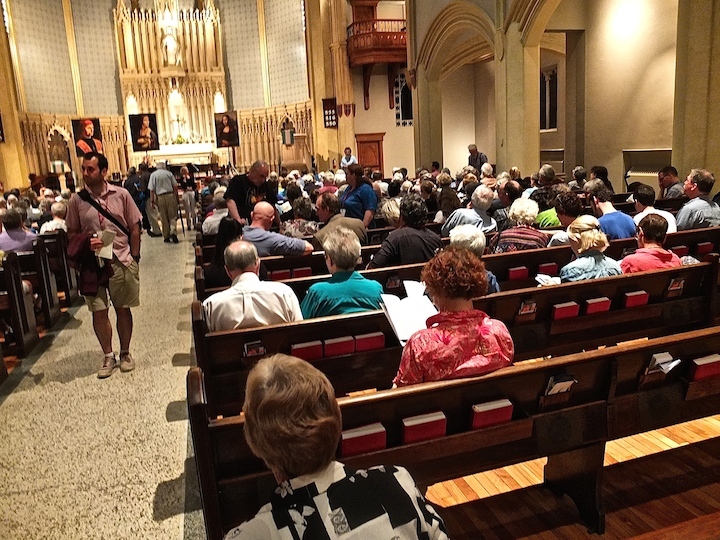 Last year nearly 500 people attended the concert. Advance purchase is highly recommended. 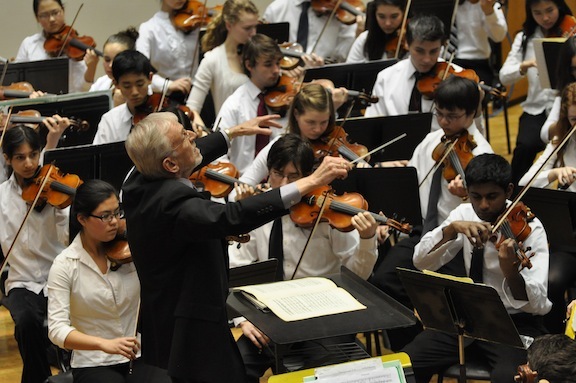 Classical music: The Madison Area Youth Chamber Music Orchestra (MAYCO) performs music of Haydn and Mendelssohn plus a world premiere of a work by Madison composer Olivia Zeuske this Friday night at the First Unitarian Society. Few young musicians, or older ones for that matter, lead a busier schedule than the young University of Wisconsin-Madison violist and conductor Mikko Rankin Utevsky (below). Recently returned from a stay in Europe, Utevsky will show his latest ambitious achievement in a program this Friday night. 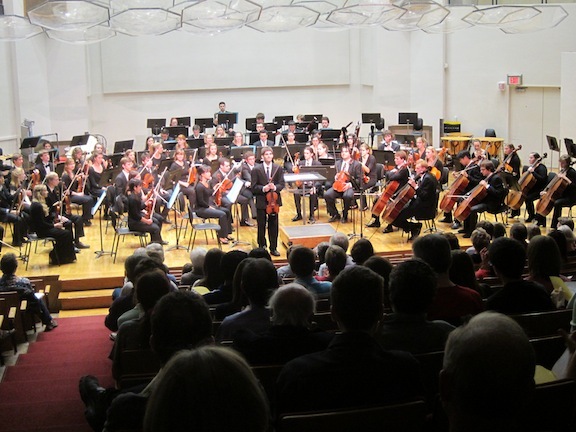 That is when the Madison Area Youth Chamber Orchestra (MAYCO, seen below in a performance last year in Mills Hall at the UW-Madison), which was founded by Utevsky while he was still a student at Madison East High School, opens its fourth season on Friday night at 7:30 p.m. 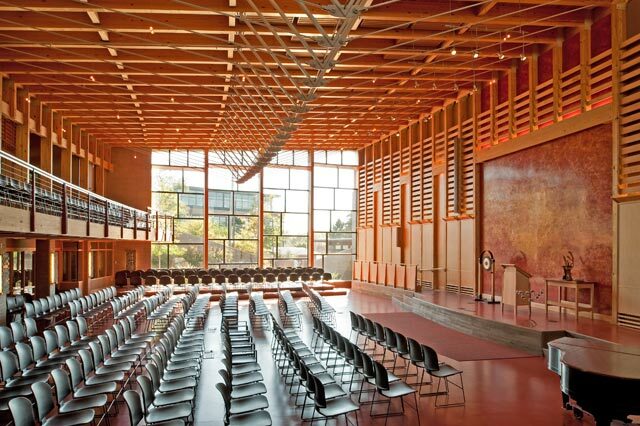 The concert will take place in the crisply designed Atrium auditorium of the First Unitarian Society of Madison (below, in a photo by Zane Williams), 900 University Bay Drive, on Madison near west side. Tickets are $7, with donations requested from students. 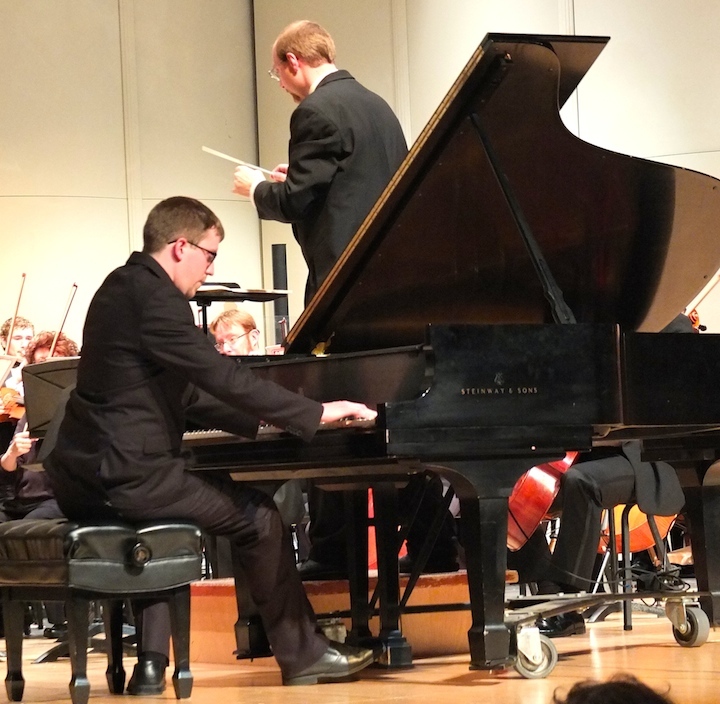 You may recall that this spring Kasdorf answered a Q&A for this blog when he performed the Piano Concerto in A Minor by Edvard Grieg with the Middleton Community Orchestra. Also on the program are the “Reformation” Symphony by Felix Mendelssohn and the world premiere of the chamber symphony “Experiment No. 1” by Olivia Zeuske (below). 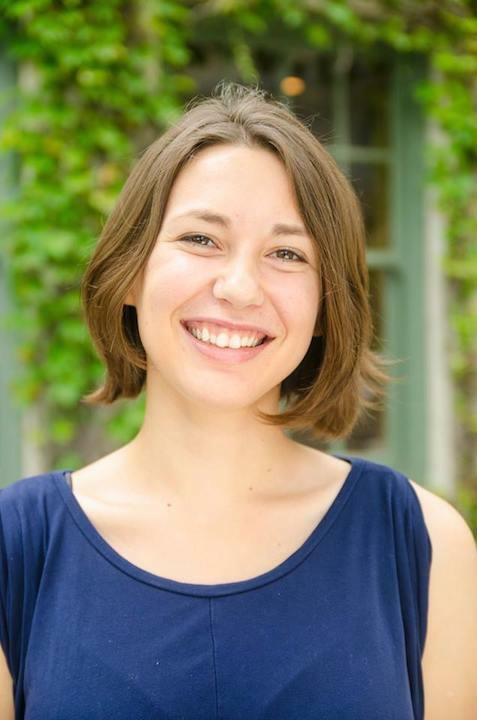 Zeuske just graduated from the UW-Madison with a double major in English and music composition, which she studied with professor and composer Steven Dembski. 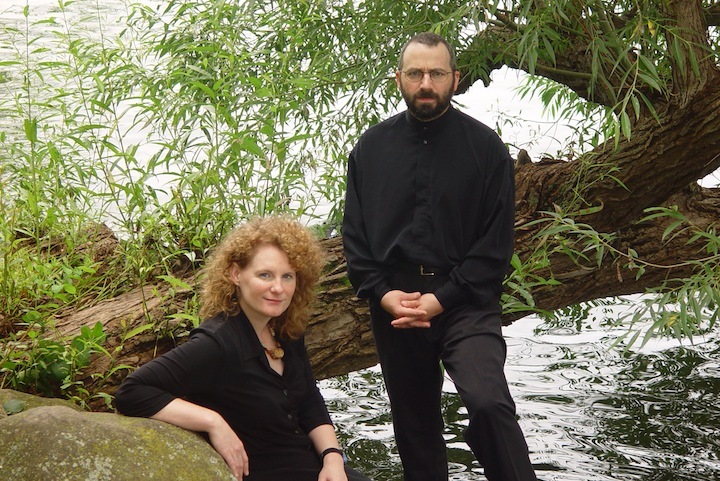 MAYCO’s next concert this summer will be at 7:30 p.m. on Friday, August 22, 2014. 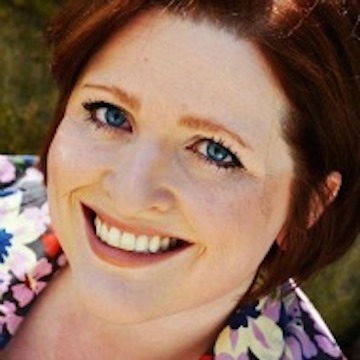 Called “Summer Magic,” it features soprano Caitlin Ruby Miller. The program includes the Overture to “The Magic Flute” by Wolfgang Amadeus Mozart; “Knoxville: Summer of 1915” by Samuel Barber: and the Symphony No. 9 in E-flat Major, Op. 70, by Dmitri Shostakovich. 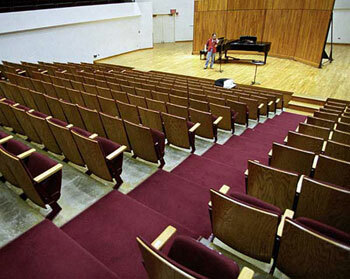 The concert will be held in UW Music Hall, 925 Bascom Mall, at the base of Bascom Hill. 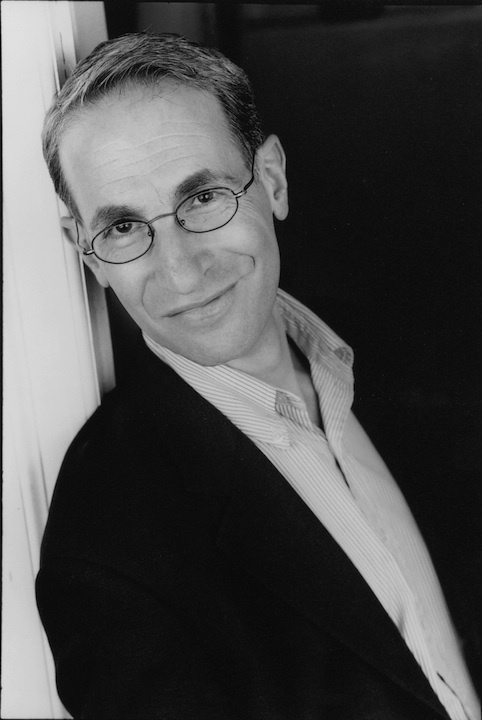 Classical music: Opera director David Ronis of CUNY is named to succeed William Farlow. 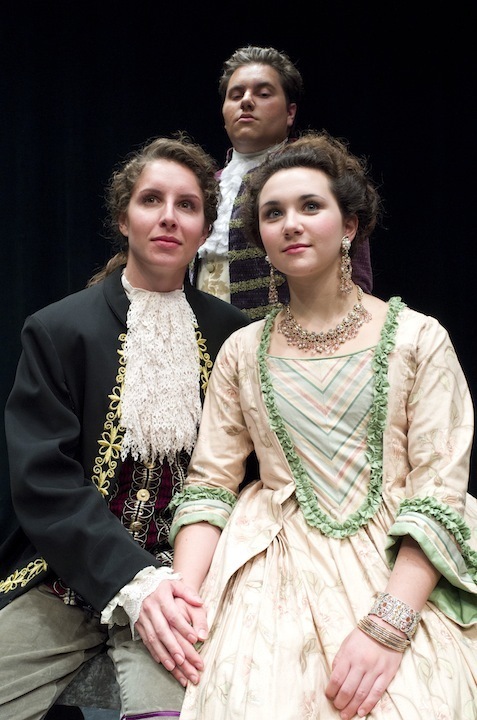 University Opera’s production of Hector Berlioz’ charming “Beatrice et Benedict” is a fine and fitting tribute to the longtime tenure of retiring director William Farlow. 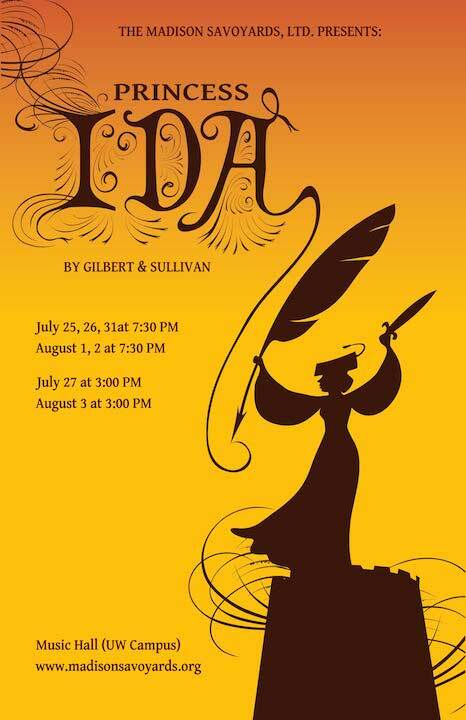 The last performance is tonight at 7:30 p.m. 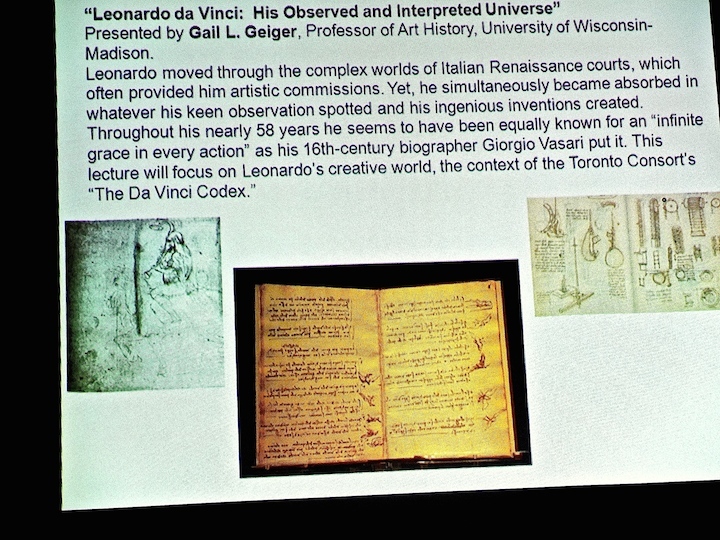 The University Opera at the University of Wisconsin-Madison has a long history of including rarities in its productions, rarities that audiences are not likely to see elsewhere. For his farewell offering as he retires at the end of this academic year, director William Farlow (below, in a photo by Katherine Esposito) has put on a particularly enterprising novelty. That “Beatrice et Benedict: — is the last and most successful of the three operas by the early French Romantic composer Hector Berlioz. 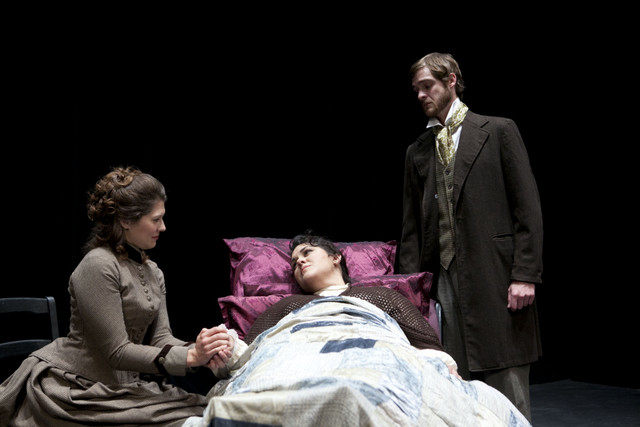 The UW Opera presented this opera before, in 1988, in the days of Karlos Moser, in a semi-staged concert performance. This time, Farlow has given it a complete staging, employing mostly exemplars of the gifted vocal talent the University of Wisconsin-Madison School of Music has been drawing lately. 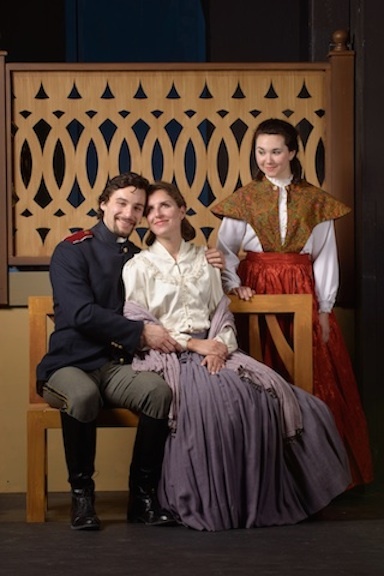 In the performance I attended Sunday night, the feuding lovers, the two title characters, Shakespeare’s Beatrice and Benedick, were sung by the agile soprano Lindsay Metzger and high tenor Daniel López-Matthews. (Below right and left, respectively, in a photo by Max Wendt). The other pair of lovers, Hero and Claudio, were portrayed by the powerfully voiced soprano Anna Whiteway and tenor Jordan Wilson. The local commander, Don Pedro, was taken by bass Erik Larson. 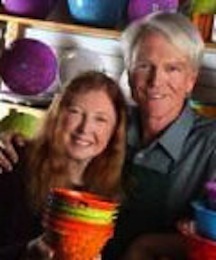 To these the cast added two veterans. 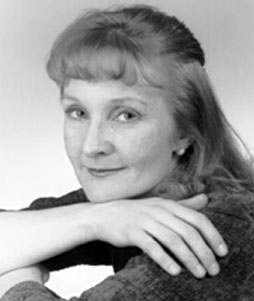 Edgewood College teacher and mezzo-soprano Kathleen Otterson (below) is a long-standing veteran of UW Opera and Madison music-making, always welcome any time, in anything, including the role here of Ursula, Hero’s friend. And baritone Benjamin Schultz, a returned alumnus, sang the comic role that Berlioz invented, Somarone, as a caricature of the pompous rivals and academics who were the composer’s life-long opposition. Following a frequent practice when this opera is presented outside of France, the vocal numbers were sung in the original French, while the revised dialogue was given in English. It’s a workable solution to a problem for singers who can sing in French, but really can’t speak it well. Fine as the singing was, it was clear that they were not uniformly comfortable singing French. Still, many moments were truly gorgeous, notably the Hero-Ursula duet in Act I, and the ladies’ trio in Act II, as well as the offstage wedding chorus. Still, even with so much of the dueling wordplay of Shakespeare’s original removed, Metzger and López-Matthews engaged well as the couple who had to be tricked into discovering that their outward hostility covered a profound attraction. 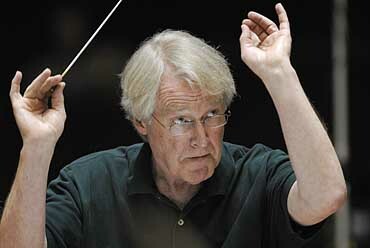 A particular asset was the pit orchestra that conductor James Smith (below) was able to work up very successfully to Berlioz’s tricky requirements. William Farlow departs leaving us with many debts to him, including this demonstration that Berlioz’s gem of a comic opera really deserves more regular presentation. 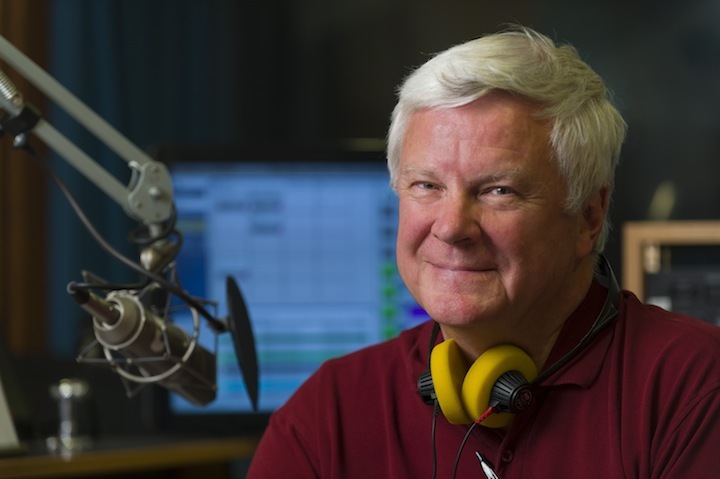 Classical music: Retiring University Opera director William Farlow bids farewell to the University of Wisconsin-Madison with three performances of Hector Berlioz’s “Beatrice et Benedict” on this Friday night, Sunday afternoon and next Tuesday night. 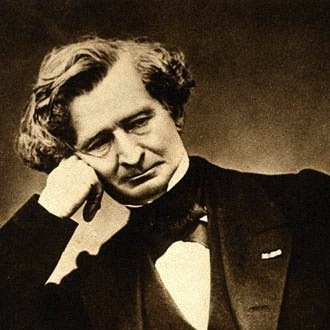 This weekend’s performances by the University Opera of the charming Shakespeare-based opera “Beatrice et Benedict” by the early and influential French Romantic composer Hector Berlioz (below top) are notable for several reasons. 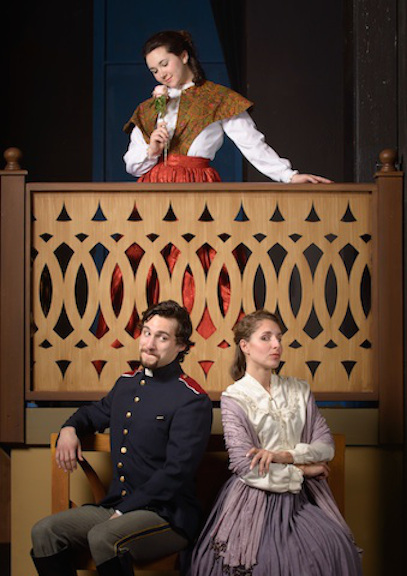 Some of the rotating cast of student performers include (below bottom, in a photo by Max Wendt) Daniel López-Matthews as Bénédict; Lindsay Metzger as Béatrice, in purple; and Anna Whiteway as Hero, in red. 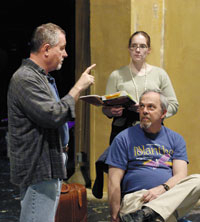 The new production is the final production by UW Opera director William Farlow (below, in a photo by Katherine Esposito) before he retires at the end of the semester. 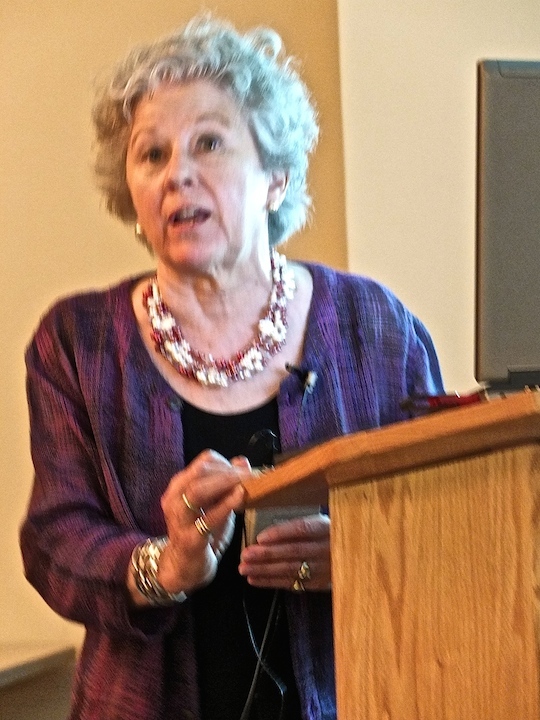 NOTE: From what The Ear understands, the University of Wisconsin-Madison School of Music is currently looking to replace Farlow with an interim director for one year, and then next year the school will launch a national search for Farlow’s successor. 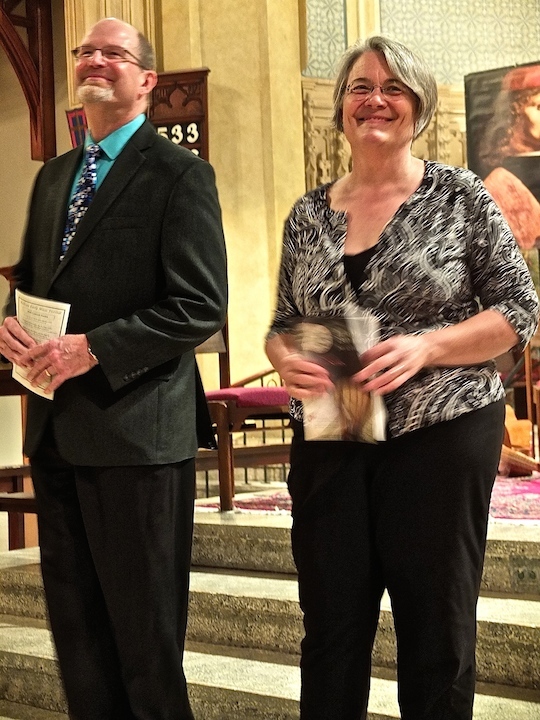 Performances will be sung in French with English surtitles created by Christine Seitz. 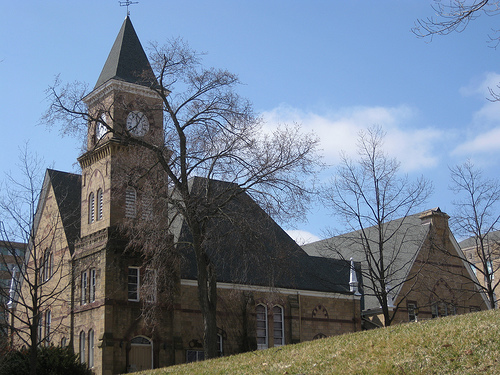 They will be held in the Rennebohm Auditorium of Music Hall (below), at the foot of Bascom Hill, on this Friday at 7:30 p.m., this Sunday at 3 p.m. and next Tuesday, April 15, at 7:30 p.m.
Tickets for general admission are $22; $18 for senior citizens and $10 for students. See below for more details. I was hoping and planning to have a longer story about the production, but things just didn’t work out. 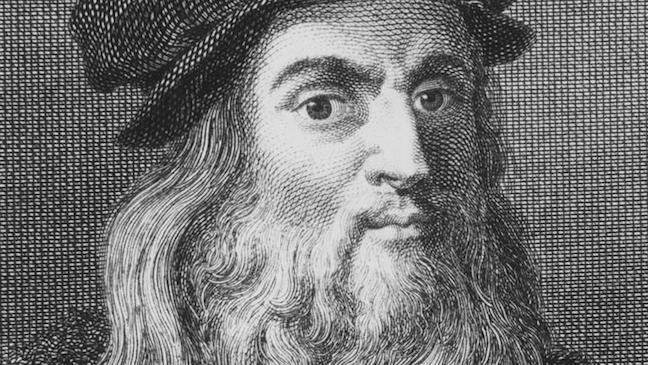 But then I thought: Why re-invent the wheel? 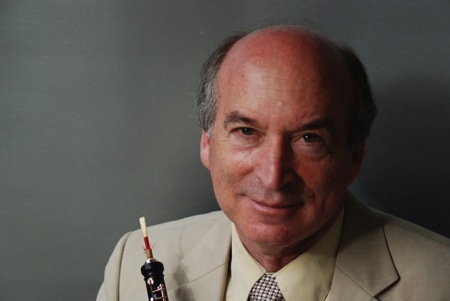 It turns out that two terrific sources -– the UW School of Music blog “Fanfare” and critic John W. Barker (below), who writes for Isthmus and for this blog — both had previews and interviews that provided excellent background for seeing and hearing this production. Classical music: Heading into Spring Break, the University of Wisconsin School of Music offers FREE concerts of percussion, vocal music from operas, piano quartets and orchestral music this week. The headlong rush toward the end of the semester at the University of Wisconsin-Madison is about to begin with the Spring Break, which runs from March 15-23. After that is over, about six weeks or so of concerts remain, and the UW-Madison School of Music concert calendar will get even more jammed with conflicts. So here are the events for this week before the break. 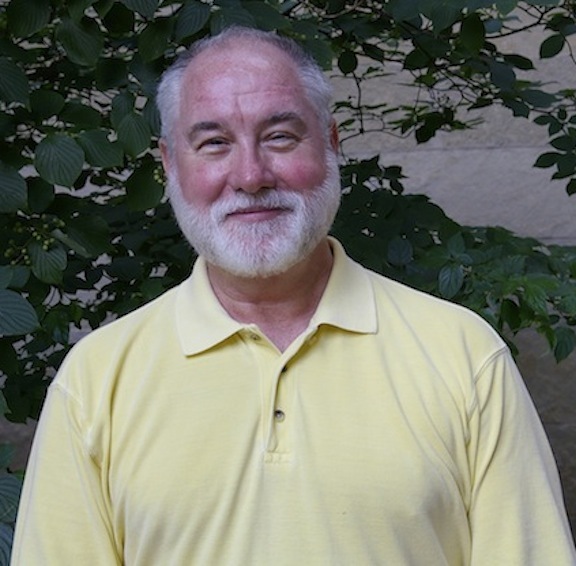 At 7:30 p.m. in Music Hall, at the foot of Bascom Hill, an Opera Workshop will take place –probably the last one for University Opera to be done by its outgoing director Bill Farlow (below, in a photo by Kathy Esposito), who will retire at the end of the semester. The event usually features student singers in scenes from famous operas with piano accompaniment. Sorry, no word yet about the specific performers or works on the program. 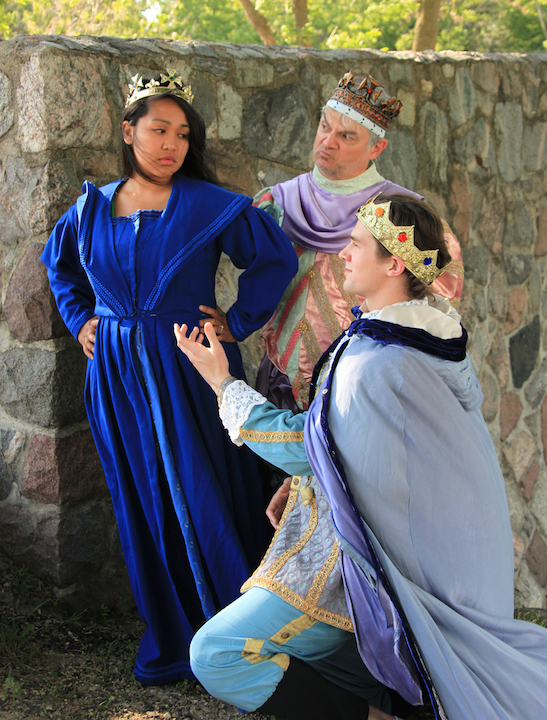 But the programs and performers usually get high marks from local opera fans. 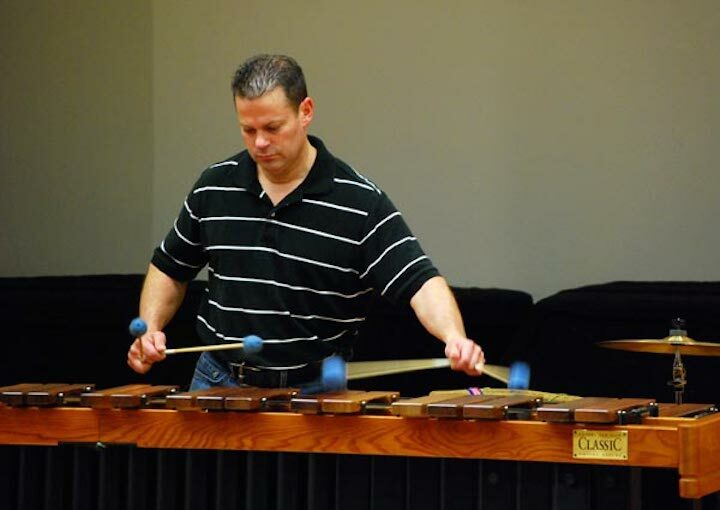 Also on Tuesday night at 7:30 p.m. in Mills Hall, guest marimba player Andy Harnsberger (below), will perform a FREE concert. 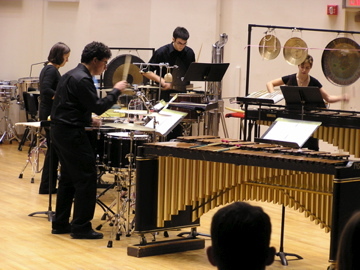 Harnberger will perform with members of the UW Western Percussion Ensemble (below), though The Ear has not received word of specific works on the program. 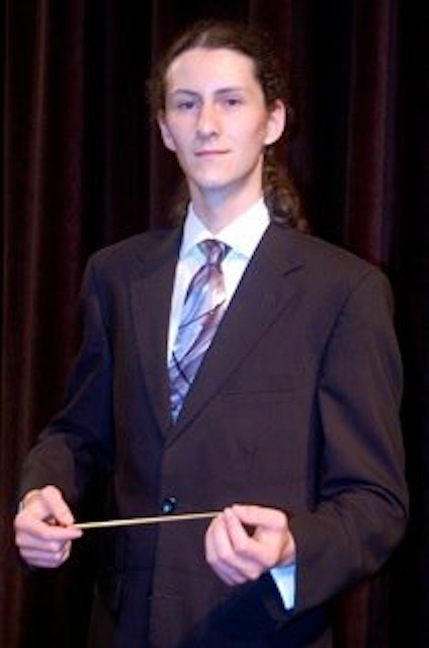 Andy Harnsberger (below) has performed as percussionist with numerous American orchestras, as well as the contemporary music ensemble “Currents”, and has toured extensively as percussionist and xylophone soloist with The Jack Daniel’s Silver Cornet Band. 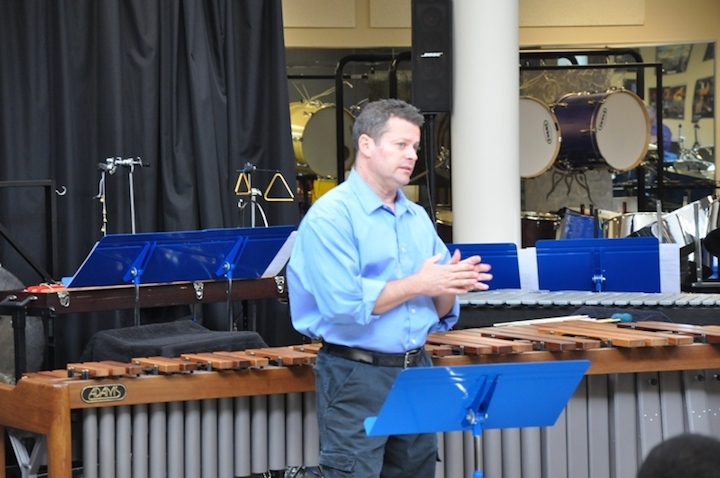 He has also made several guest appearances on NPR, both in interviews and in live performances, to bring public awareness to the marimba as a solo instrument. 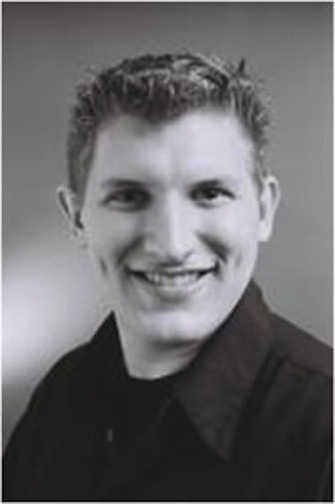 Harnsberger is Assistant Professor of Music and Percussion Coordinator at Lee University in Cleveland, Tennessee and is active throughout the year as a freelance percussionist and recitalist. He is in demand as a clinician across the country and internationally, presenting clinics and master classes at many universities each year. 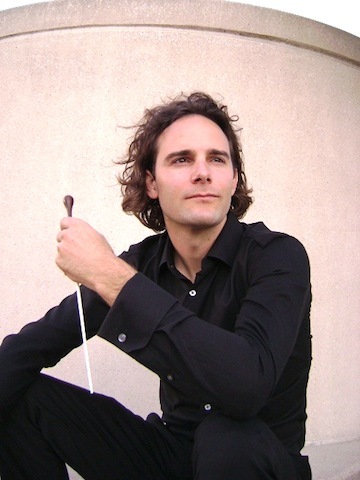 His compositions have been performed at PASIC and around the world and he is a recipient of the ASCAP PLUS award for his contributions to American Concert Music. 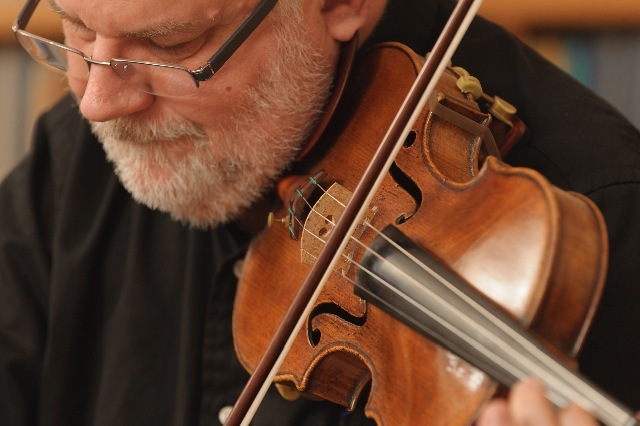 Harnsberger earned his Doctorate of Musical Arts in Performance and Literature at the Eastman School of Music in Rochester, New York, where he also received the prestigious Performer’s Certificate. Andy is a performing artist and clinician for Pearl Drums and Adams Musical Instruments, Innovative Percussion, Inc., Evans Drum Heads, Sabian Cymbals, Ltd., and Grover Pro Percussion. 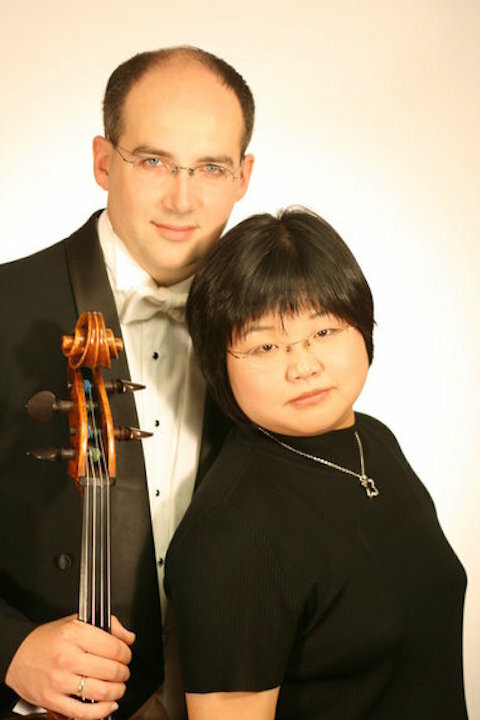 Also on Tuesday night at 7:30 p.m. but in Morphy Recital Hall, cellist Mark Kosower and his pianist wife Jee-Won Oh (both below) will perform an evening of famous piano quartets: one in G minor by Wolfgang Amadeus Mozart (at the bottom you can hear a popular YouTube video the final movement of the Mozart quartet with an intriguing abstract animation or illustration); the other in C Minor by Johannes Brahms. 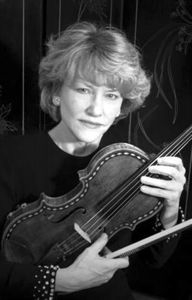 They will be joined by another wide-and-husband team: UW violin teacher and Madison violinist Eugene Purdue (below top) and Pro Arte Quartet violist Sally Chisholm (below bottom). 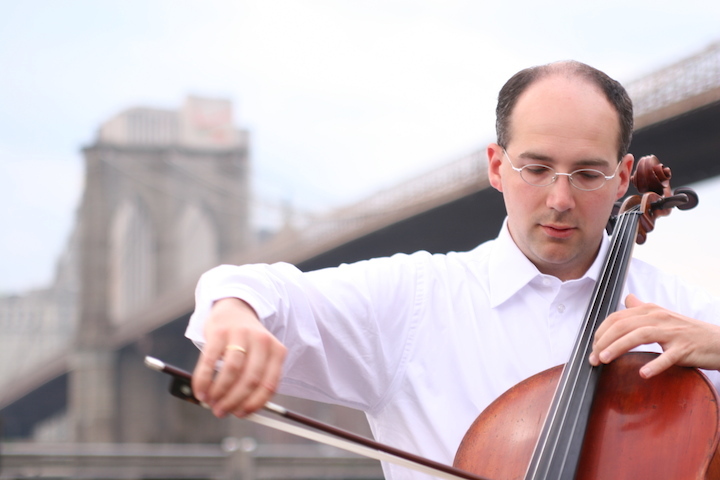 Principal Cellist of the Cleveland Orchestra, Kosower will be at the UW School of Music March 10-12. 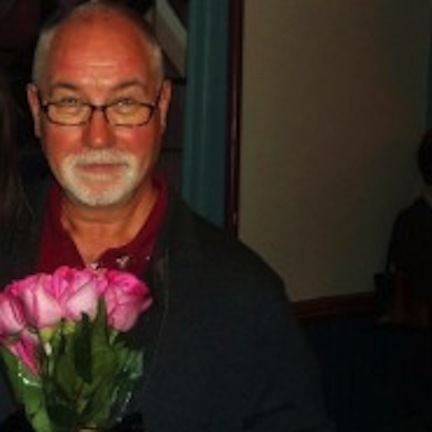 He is on the faculty of the Cleveland Institute of Music, and previously taught at the San Francisco Conservatory. He is from Eau Claire, Wisconsin, and has performed in Madison on many previous occasions. 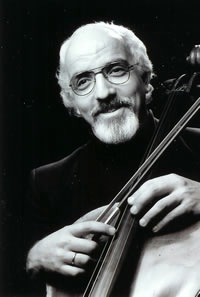 Kosower will also offer a cello master class on Wednesday, March 12, in the afternoon. The time and place are yet To Be Announced. 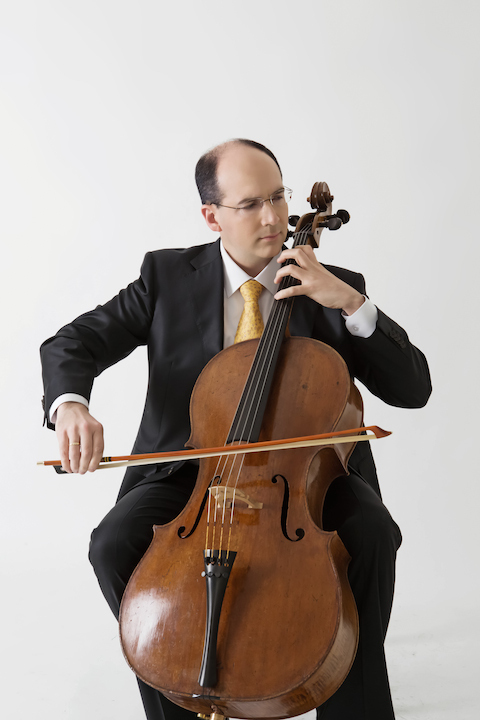 There is an afternoon master class with resident guest cellist Mark Kosower (below). SEE ABOVE. At 7:30 p.m. in Mills Hall, the UW Chamber Orchestra (below), under director and conductor James Smith, will give a FREE concert. the Serenade No. 2 by Johannes Brahms. 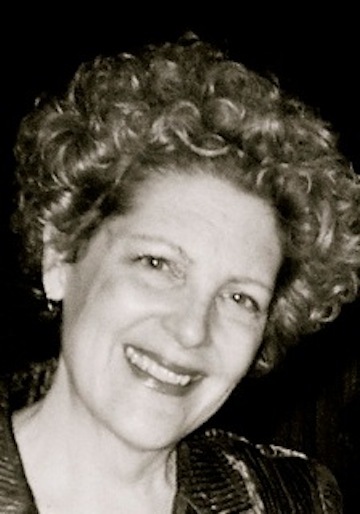 Classical music: Meet Kathy Esposito, the new concert manager and director of public relations at the University of Wisconsin School of Music. She has big plans to help the school, from securing a new s concert hall to overhauling the website, starting a blog and connecting with other local music groups and media outlets. 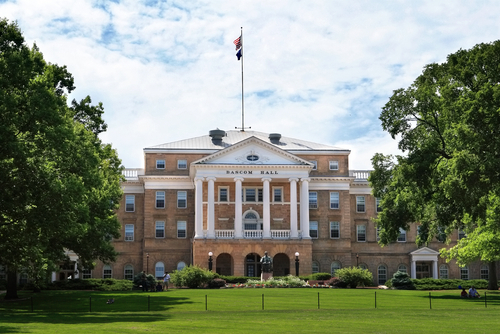 Today is the first day of classes at the University of Wisconsin-Madison. Esposito was hired toward the end of last season and has been furiously and energetically on the job all summer, preparing for the fall by redesigning the website at www.music.wis.edu, producing a season brochure and starting the blog “Fanfare” among other accomplishments. This promises to be a year of big challenges, from a new department director to new teachers, at the School of Music. I asked Esposito to give an interview and to introduce herself. “I guess all I would say about me is that I developed my music appreciation through my two sons who are now classical musicians. 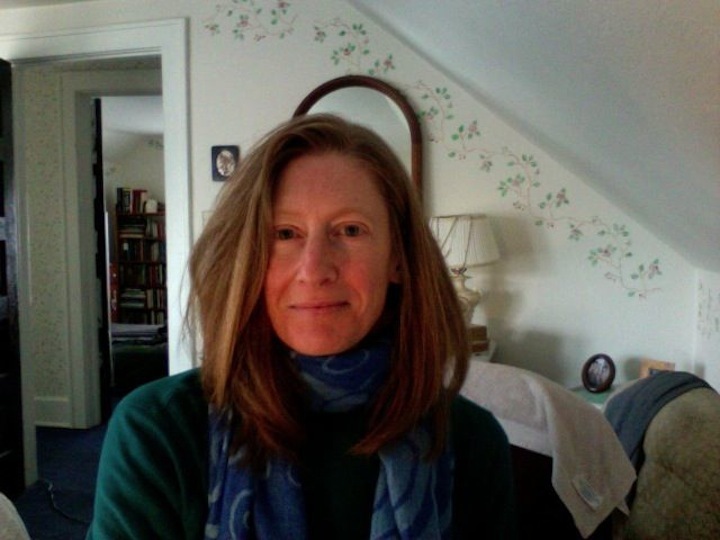 “I was a freelance journalist and communications specialist at the Wisconsin Department of Natural Resources for years, but while doing so, we three immersed ourselves in music and theater. 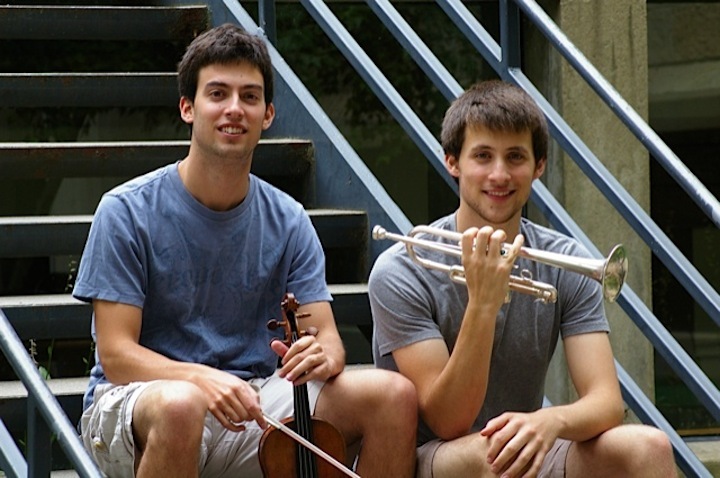 “We listened to CDs at home, attended productions in Madison, Milwaukee and Chicago, and the two boys took violin lessons. 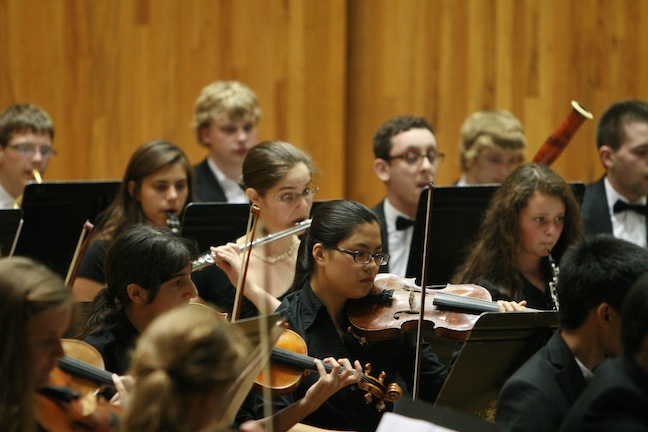 They eventually auditioned into the Wisconsin Youth Symphony Orchestras (WYSO, below, in a photo by Cheng-Wei Wu). “Music for me is completely cathartic. I understand well the intense dedication required to excel, and I am always impressed by the maturity of these young players who by some miracle develop an appreciation of something fairly sophisticated. 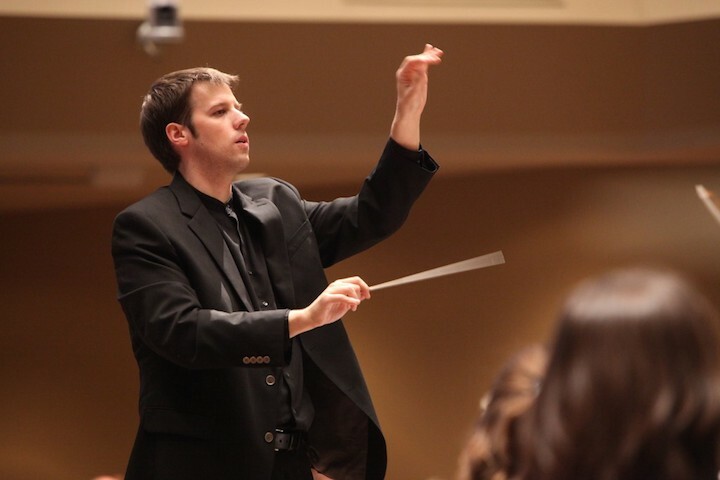 “I love the classics and believe these should be our foundation, but also understand that some are interested in taking their passion to a different, more contemporary place (whether composing or performing), something untried and not wholly formed, and the university is a perfect place to do that. “My goal is to present their efforts before the Madison community and beyond, not only to bring bodies into our halls (it’s no fun to play to an empty hall) but also to demonstrate that the music school is as deserving of donor support as any other program on campus. Why did you want the job of concert manager and director of public relations? 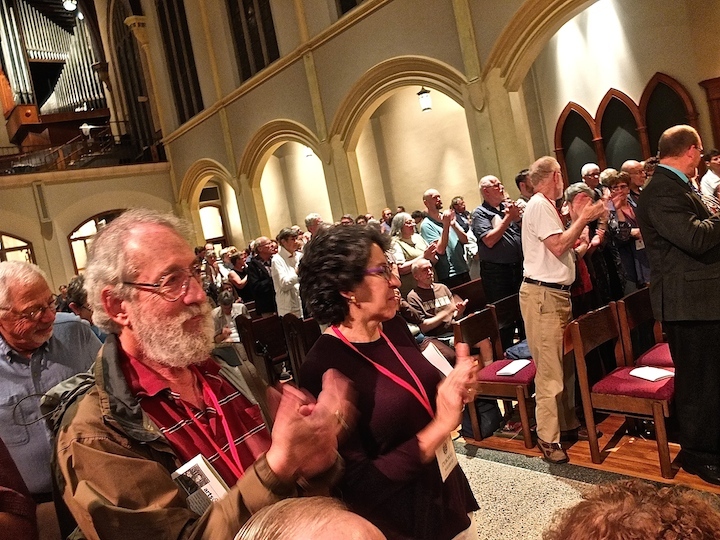 We made a point of attending music and theater performances in Madison and elsewhere, and I am quite passionate about the marvelous impact that it has had on all our lives. Both are continuing in music and have promising lives as people, not just musicians. That’s what music can do for people. Because of these connections, I knew there was much good stuff going on under the roof of the Mosse Humanities Building that others didn’t know about, and it bothered me. When people think of classical music in Madison, what comes to mind? The Madison Symphony Orchestra. The Wisconsin Chamber Orchestra. Concerts on the Square. 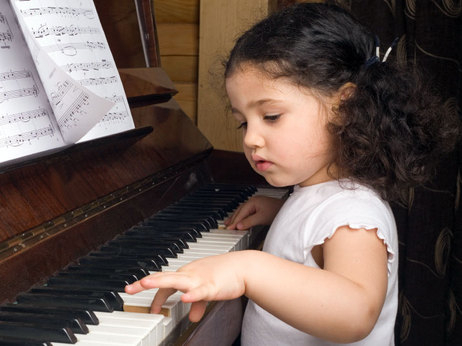 The Bolz Young Artists Competition. Why is that? It’s because of marketing — plain old honest “getting the word out” any way possible. In this regard, the UW School of Music can do much better. But we don’t have a budget for paid advertising, which means we need to be more creative with our publicity: telling people about the accomplishments of students and faculty and offering them a reason to care and be excited about what they will see. I felt that I could help. I have a background in journalism and more recently in business marketing and digital media, and I know the importance of telling stories and being creative, which, nowadays, includes the Internet world as well as print. This new world is a huge, huge area, and I don’t claim to be able to do all of it well, but the truth is that many people who grew up in the world of print are totally overwhelmed by what’s needed now. So the upshot is that I felt strongly that I had an overall resumé that matched what the SOM needed, and I wanted to help. What major projects and changes do have in the works, including the website, web streaming for audio and video, spreading the word about the new building and outreach programs, and the like?? We plan to completely overhaul our music school website and will feature prominently the audio tracks that we’ve accumulated over the years, so that when you arrive at our site, your eye will fall upon a “Hear our Sound!” display box that will invite you to listen to one of several performances. 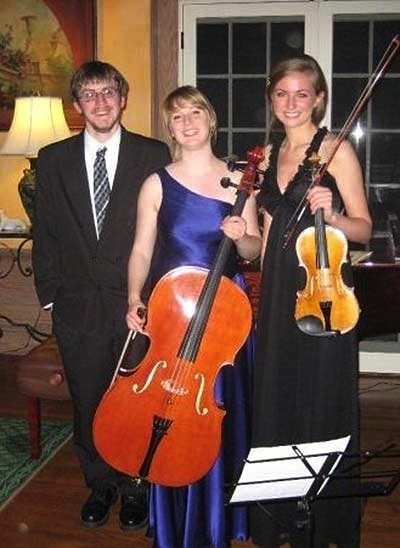 That might include an orchestra, the Perlman Trio (below), the wind ensemble, a jazz septet, a concerto competition winner, or a new piece by one of our resident composers; so many I don’t know how we can possibly choose among them. This is blow-your-socks-off great music. Our current website has never had a page for news; it was fairly “static,” as web designers say. To address this in the absence of a new site, I recently started a blog, “Fanfare,” that provides a place to publicize recent accomplishments, and we also are making great use of our Facebook page. I invite all your readers to sign up for the blog (it’s a free subscription) and to become our Facebook fans. Future plans include acquiring equipment to video-record and live-stream some concerts, so that parents and alumni (and possible donors) around the country and world can watch in real-time. I know how special this is because my sons perform out-of-town, and I have been able to watch them play from the (relative) comfort of my computer chair. It’s the next best thing to actually sitting in the concert hall seat. Regarding the new music building, to be located on the open lot on University Avenue most recently occupied by several bars: We are about half way toward our goal of raising about $46 million. The project is actually part of a bigger UW plan that includes the entire East Campus Gateway, so the UW Foundation is in charge of the lion’s share of fundraising, which includes soliciting the largest donations. My role now is to continue to raise the school’s profile so that prospective donors can feel their efforts are going to very good use. Of course, anyone is welcome to donate to the new performance fund, no matter the size of the contribution. 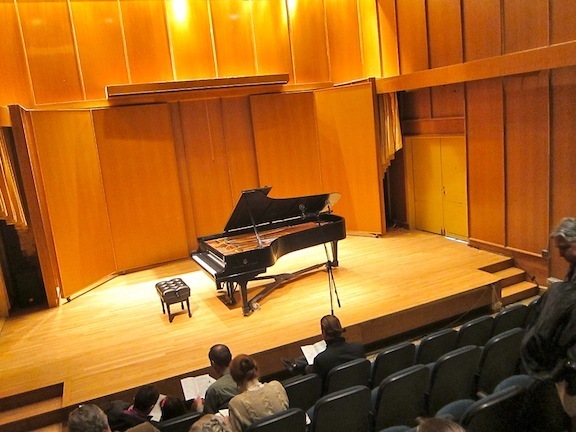 What are the major challenges you see confronting you and the UW School of Music? Our biggest challenges right now are securing more money for tuition scholarships and for our new performance space. Of course, better publicity will help here; people are more likely to donate if they see their money being put to good use. College scholarships are critical. 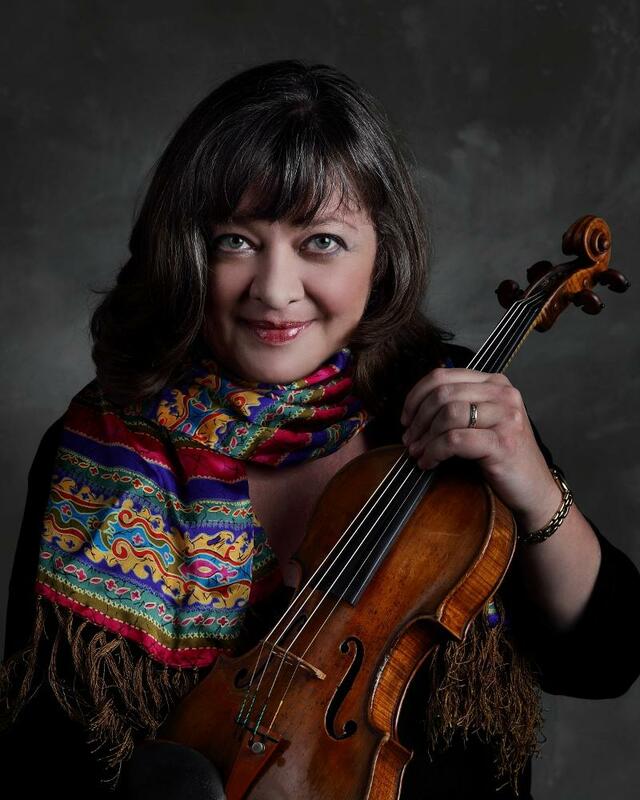 A young violinist may want to study with Felicia Moye (below top), or a young percussionist with Tony di Sanza (below bottom with UW piano pedagogue Jessica Johnson), but if she or he gets an offer from a competing music school that includes funding, and we can’t match it, where do you think that student will go? And yet we want to be considered a top music school, just as UW is tops in so many other ways. And graduating with a degree in violin or trumpet performance but with $30,000 in debt is extremely unwise. We have several wonderful patrons who understand this and have donated money to fund talented students through their undergrad and grad years. We’d love to discover more people like those. 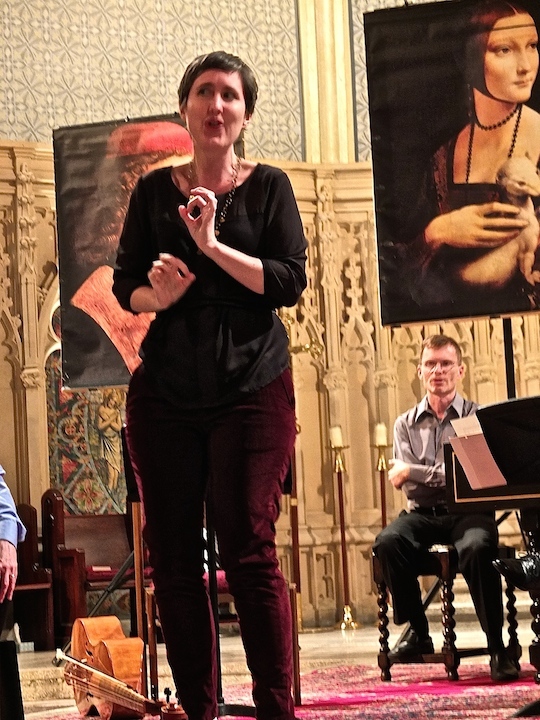 These grateful students have advanced to successful careers as performers and university faculty, and while still here, are more than happy to repay their patrons with private concerts. Meanwhile, our concerts are presented in a building that is simply worn out, dated and dingy. We have one large hall, Mills Hall (below top) that seats over 700 people, too large for many concerts; and one smaller hall, Morphy Hall (below bottom) that seats about 150, too small for many concerts; and one hall (Eastman) that we don’t use because of problems. We have furniture in the basement Strelow Lounge that I refuse to sit in because the upholstery is so dirty. We have windows that are streaked with grime and cannot be opened or cleaned. It is a distinctly uninviting building. How do you think you can get the concerts, master classes, etc. at the UW to draw bigger and younger audiences? Well, there are many things we can do, all of which I am confident would have a cumulative impact. The most difficult but also the most helpful is a successful story pitch to traditional media outlets like newspapers, TV and radio. 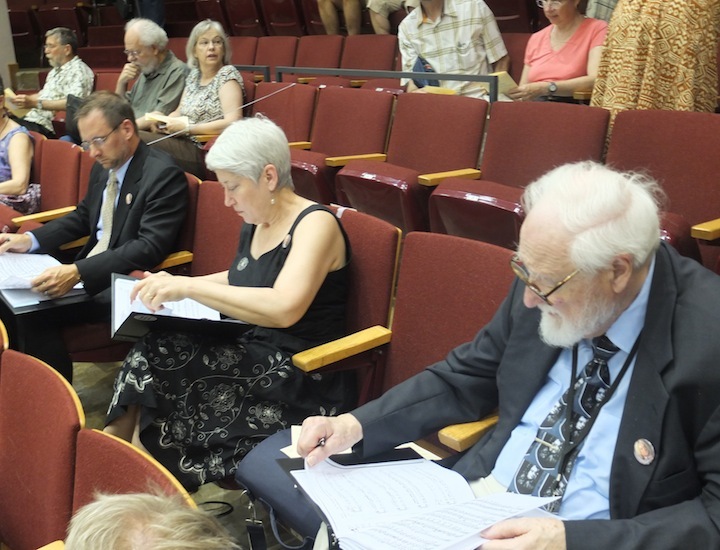 We had great crowds here for two concerts this spring that made it into traditional print media: The 40th anniversary of the Wisconsin Brass Quintet (below top, in a photo by Katrin Talbot) and oboist Marc Fink’s farewell concert (below bottom). But media space has shrunk, and there’s a lot of competition. So we need to market ourselves, first and foremost, using all the tools of new and old media. That means more fully utilizing the venues already available, such as this blog and others like it that are happy to announce or discuss our events. We also are now more active in the area of social media, especially Facebook, and have gained a hundred new fans in just the last month. Second, I am interested in forming new partnerships that would bring SOM performers into new spaces, place them in front of new audiences, and send concert announcements to new venues. Some of my ideas are probably crazy, but you have to start somewhere. –I’d love to see joint WYSO/UW concerts of some sort: perhaps preface a WYSO concert with a UW piano trio or jazz octet. 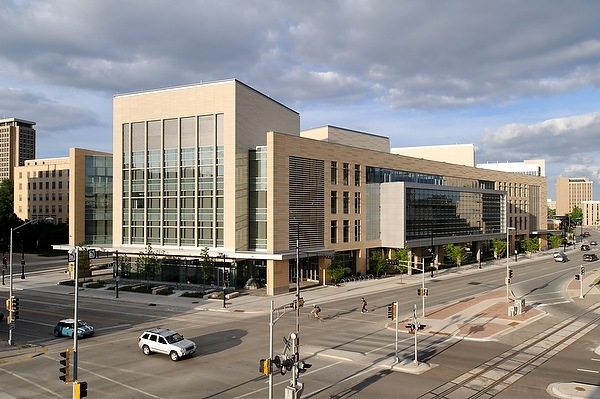 –I’d like UW ensembles to perform outside of the music building, especially in the new Wisconsin Institutes for Discovery (below)/Town Hall. –I’d like to start an annual fall music concert that showcases the entire school, including recently written, more avant-garde works, jazz and vocalists. –I’d like to partner with Wisconsin Public Television to tell a story about our school. –I’d like to see the new music building include a family-friendly audience space, in the rear of the hall, with a one-way mirror and piped-in sound that would allow the children to watch a concert while being normal children: not always quiet! I’ve never heard of such a space in a concert hall, and we could make our mark here and bring lots of Dane County families in for free performances. –I also would like the new music building to include a lighted marquee that announces the next night’s concerts, just as we see in larger cities. Now that would attract some notice! –We also can send concert announcements to school newsletters and music teachers, and emphasize the fact that 99% of ours are free. –What ideas do you listeners have? I sure can’t think of everything! Well, I’m only one person, so I can’t say that I’ll be able to pull all of this off. However, I do feel committed to UW, committed to music in general as it has done so much for me and my sons, and I enjoy a good challenge.